Maximize your pantry space with our exclusive White Elfa Utility Mesh Pantry Door & Wall Rack Solution! Available only at The Container Store, it makes the most of often-wasted vertical space on a door or wall and is totally customizable! The six baskets (two each in three sizes) can be easily repositioned to fit your storage needs. It's easy to remove a basket if you need to take ingredients to another area. Build your own customized solution with our Elfa Utility Door & Wall Rack Planner. White Elfa Utility Mesh Pantry Door & Wall Rack Solution is rated 4.9 out of 5 by 22. Rated 5 out of 5 by Helenka from Easy Install - Great storage Easy to install....holds a great amount of spices, mixes, jars, condiments, etc. I should have purchased this item years ago due to my lack of storage in the kitchen. I even ordered another unit for the other door. Great purchase...and of course no hammering, screws, or installation costs. Rated 4 out of 5 by ContainerShopper1 from Too large for my pantry door This is great & looks great, but unfortunately the medium & large baskets are too large for my narrow pantry door. Now my door won't close properly. I have to call and see if they have a "narrow" version that I read in some reviews. Otherwise, on normal-size doors it would be awesome. The bottom you have to slide onto the side of the door that doesn't have the door handle. Rated 5 out of 5 by Chooey from It was a perfect solution! We needed a place for all the things we need in a hurry (batteries, hammers, flashlights). This is perfect and easy to assemble! Rated 5 out of 5 by mommaM from Huge Spaces from a door! 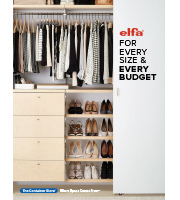 We love the Elfa pantry door organizer! We previously had one of those 24 pocket door organizers but the Elfa system looks a lot better and I feel we can store more items. We put medicine, bibs, baby cereal, juice, cleaning supplies all in there. We chose to mount ours to the door rather than hang for extra security. Rated 5 out of 5 by Anonymous from great purchase The is one of the best purchases I have ever made. It was easy to install, without tools. Holds an unbelievable amount of stuff. I don't know how I lived without it. I have had a few compliments on it already. Rated 5 out of 5 by Nikki62 from Best purchase ever! This over the door pantry rack, is so durable and stylish compared to many others that I have purchased in the past. It gives such a sleek look while allowing my products to be organized. I would recommend this product to all of my friends!! Rated 4 out of 5 by TallCindy from Great for lighter things I needed some extra pantry space and bought this rack for the back of a door off my kitchen. A little pricey, but I needed storage. It went up very easily and quickly. I put canned goods on it.... The added weight to the door changed how the door closed. Not good. Since then, I removed the canned goods and no longer weight it down with very heavy items. In Summary, for some additional storage of plastic bags, coffee, sponges, plastic bags, it is good. Just don't max it out with very heavy items. Rated 5 out of 5 by SHSSailor from Platinum Elfa Utility Mesh Pantry Door & Wall Rack I bought my new (to me) house March 31, 2015. Second item on the list of things to do was rip out the kitchen and start from scratch. That included an awkward washer dryer layout. I demand pantry space (I had two pantries at my previous home). The awkward dryer space was turned into a custom pantry. However, I needed some place to put condiments. The Elfa Utility Mesh Pantry Door & Wall Rack was the answer. When I show off my new kitchen to friends and family, they all comment on the Elfa Pantry Door Rack. Thank you so much for a great product. Rated 5 out of 5 by mnm1217 from So convenient This has helped us in our small condo! It helps out storage system and allowed for us to actually store what our "pantry" couldn't. we love it so much, we registered for a second one! Rated 5 out of 5 by Laurie777 from Elfa utility mesh pantry door rack My husband and I downsized and have some limited cabinet space. This allowed us to double our storage space and was so easy to install. I did it myself as my husband was sick. I am so pleased with the final product. Rated 5 out of 5 by Seloprs from Love Elfa Pantry Door Solution! This was my very first Elfa purchase. I absolutely love this Elfa pantry door rack. I bought a couple of extra baskets later to add to our new rack. I keep cups, paper plates, plastic forks, paper towels, plastic trash bags, aluminum foil, plastic wrap, parchment paper, step stool, and more in the assorted baskets! This is the perfect solution for our small kitchen! Rated 5 out of 5 by midi25 from Easy to install, awesome to use I installed this shelf myself, it took 15 minutes from start to organizing. Rated 5 out of 5 by PinkLinda from Wall Rack & pantry utility mesh holders I recently moved from a big big house to rent a townhome until I find a new home...so didn't want to spend a lot of money and I needed storage in kitchen. although I thought a little pricey....I ordered the rack with mesh. It only took a few minutes but I installed it along with the drawer things... only wish is... that I did NOT get mesh because it is hard to see through it. Should've gotten just wire no mesh. But I somewhat blame that selection based on the pictures or rather poor quality pictures of the product. You try to see and you enlarge it but it doesn't really enlarge. I got mesh thinking oh the little packets won't fall through but you can't see through too well. I'm glad I got the medium size instead of smalls... be sure you do measure your pantry door...mine is narrow so I got the narrow size. If the Container Store reads this...my suggestion would be to provide the ability to actually enlarge the pictures to really see the product clearly. Rated 5 out of 5 by MidgeO from Fabulous shelves I looked at this unit for months. It went on sale and I really started to consider purchasing it. Finally on the last day of the sale, I did it. I'm sorry I waited so long. It's GREAT! I picked the mesh since I wasn't 100% sure what I was putting on the shelves and didn't want to worry about items falling through the wire baskets. I was able to get many of my boxed items all in one place. My kitchen is small so, I had things through out the house. I wasn't using the items - they were out of sight and out of mind! Added benefit, according to my husband it was easy to install. I love it so much I want one for my bathroom unfortunately, the door is smaller and the baskets are too wide! Rated 5 out of 5 by Jabrn67 from Great space saver Bought this to use in our log home that had very little cabinet space. Used it in our under stairs closet for my spices etc. love it! Rated 5 out of 5 by Bearface from Great item I had a bit of a problem with the bottom of the door mount so I secured the rail with some screws but it's a great product and maximizes my little pantry. Rated 5 out of 5 by Bonnie41 from Organizing made easy Easy to install. Multiple choices for baskets, sizes and placement. I highly recommend this product. Rated 5 out of 5 by Sarahmama4 from Extra space We have three elfa over the door racks and love them! The one behind our pantry door freed up space in our cabinets. The one behind our entry closet holds wrapping paper and hair products. The one behind our basement door holds our dvd's. What does the the door look like on the outside when you hang this? The Elfa over the door hooks barely show. See pictures below! What is the width of the shelving? I have atypical pantry doors and need measurements to see if they will fit. Thanks. Does the pantry door &amp; wall rack solution require drilling any holes in the pantry door? Yes, The screws should be included and installation is easy. Will this work on a single paneled door? I have a 7' single paneled door - meaning that the hanging standard will not sit flush against the door for the 64&quot; height of the panel, only at the top and bottom of the door. Is this a problem for stability? Would adhesive felt pads between the standard and the panel help? Yes, our elfa utility Mesh Door &amp; Wall Rack will mount on a 7' single panel door successfully. Please contact us at 1-888-CONTAIN (266-8246) for further assistance. my door is 2 inches thick, are the hooks wide enough to fit? elfa utility Door &amp; Wall Rack Commercial Over the Door Hooks can accommodate doors up to 1-3/4&quot; thick. What is the weight limit for the door &amp; wall rack? Each basket's weight limit and total weight limit of this system please. I read that this rack could be designed for an 8 foot door, but when I checked the set up section, it went to 94+ inches, not 96&quot;. The Mounted Standard (Vertical) can be customized to fit most any door. You can call our elfa design team at 1-800-733-3532 and we can help ensure you order the right size Mounted Standard for your door. Is it possible to screw the system into the door? Don't want to use over the door hooks. Yes, our elfa utility Mesh Door &amp; Wall Rack Solutions can be door-mounted using our Screws &amp; Anchors for Hollow-Core Doors (shown below).